Today was Day #4 of Chocolate, Rose and Strawberry Theme Week. 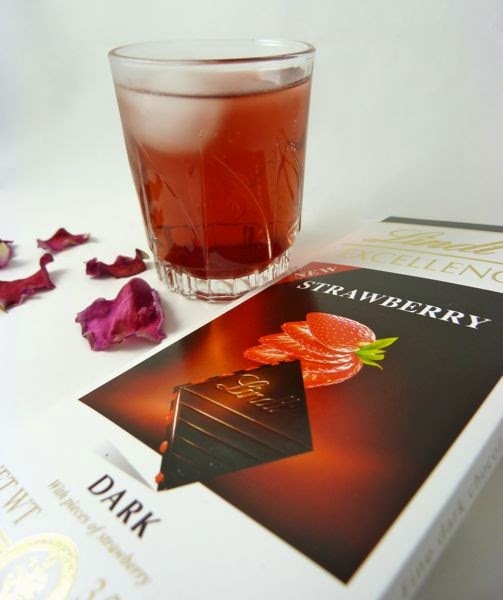 This Strawberry dark bar was a relative newcomer in the line of "Excellence" premium chocolate bars from Lindt and Sprungli (based in Switzerland; with manufacturing in France and operations in the U.S.). I had a similar strawberry chocolate bar yesterday with excellent, natural-tasting pieces of organic, freeze-dried strawberries embedded in dark chocolate. 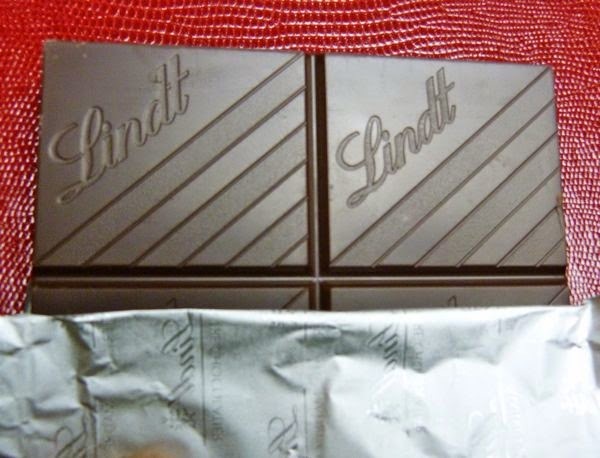 Today's Lindt Strawberry dark (47%) bar was fine but the tiny strawberry bits in today's bar seemed to have an artificially pumped up flavor and aroma. I would have liked to try this bar with just natural strawberry flavoring. To accompany today's Strawberry chocolate bar I made a non-alcoholic version of a shrub (a cocktail made with a bit of fruit vinegar syrup). Rosewater, strawberry syrup, framboise (raspberry) vinegar, and a dash of berry anti-oxidant juice went into this virgin Rose Strawberry* Shrub, along with water and ice. It was very refreshing, and I look forward to trying this drink with other chocolate desserts in the future. *As noted in a previous post, the rose family is quite large, and includes strawberries, raspberries, and other berries and fruits.